Putting the Fun into Fundraising! Over the past month Projects Abroad volunteers have been very busy helping improve the quality of life of the Talibés in Senegal. Talibé is the term in Senegal for street children who come from disadvantaged families, who are sent to live with religious leaders at an early age. They don’t receive any formal education and are forced to beg on the streets for food and money. Projects Abroad volunteers work with several Talibé centers throughout the year and we fund a variety of programs, from free breakfast schemes to Micro-finance loan projects for older Talibé students. Earlier in November volunteers also went to the local bus station to provide medical attention to the street children begging there. 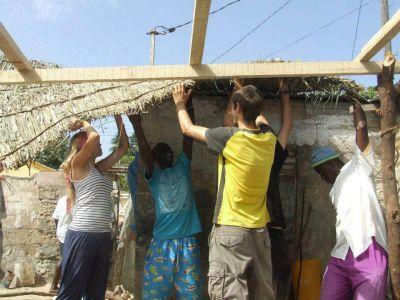 They also donated melon and yoghurt and built a shelter for those children living permanently on the streets of Senegal.